The Logic Supply team just returned from Las Vegas where were we joined thousands of security industry professionals from around the world at the ISC West 2016 Expo. The largest show of its kind in the US, ISC West gave us a chance to connect face to face with some of the people we’re helping to build the next generation of security solutions. Between conversations about rugged NVRs, mobile security, inventory management and warehouse surveillance, we also had a chance to walk the expansive show floor and take in some of the latest advancements from an incredibly diverse selection of exhibitors. Here are just a few of the things we saw and the takeaways we left Las Vegas with. Drones – There’s no denying that drones are a hot topic of conversation, both in the security industry and beyond. There were a number of companies on hand at ISC West 2016 exhibiting drone-based products and technology, including autonomous surveillance devices and emergency response solutions. We also heard a fair bit of talk about tethered drones, which could be relied upon to operate effectively for longer periods thanks to a hard-wired power feed. As you might expect, many conversations also centered around the various safety and privacy concerns that the recent explosion in drone popularity have brought to the forefront. From drone detection systems to counter-drone devices and services, there’s certainly a burgeoning industry developing around how both consumers and businesses will handle the huge influx of drones. A recent study predicted sales of consumer drones could top 90 million units by 2025. Body Cameras & Law Enforcement – Another hot button issue that spilled over onto the floor of ISC West 2016 was the use of surveillance camera technology in law enforcement. There were a number of companies exhibiting new body camera tech, and quite a few of our conversations centering around Network and Digital Video Recorders for use in mobile surveillance and law enforcement in-vehicle installations. Reliability, ruggedness and variable power capabilities were all frequent topics and it was interesting to speak to integrators about the challenges of effective and dependable surveillance solutions. Our DS-1000, Nuvo-5000 and ML600 were all of particular interest for these type of installations. There was another consumer technology on display that is beginning to make its way into the commercial sector. The ability for users to network their IP security setup with other aspects of building automation is something we’re seeing more of in today’s smart factory and smart business projects. By combining access control, surveillance and even things like climate controls and lighting, complete automation solutions are now accessible to a wider range of users than ever before. While the Industrial Internet of Things (IIoT) is often talked about in terms of connected manufacturing machines, there are huge opportunities for security professionals to harness cloud-based solutions to streamline surveillance and fully automate what were once manual procedures. What Was the Coolest Thing We Saw? There were so many incredible innovations on display at ISC West 2016, it was hard to choose just one exhibit to feature, but we’d have to say that Knightscope’s Autonomous security robots took the title of most fascinating device demo. The Knightscope K5 that we had a chance to check out on the show floor serves as a robotic sentry of sorts, offering motion detection, real-time video, perimeter breach alerts, emergency intercom functionality and a range of other features that allow it to patrol a facility, parking lot or campus and collect and deliver data to on-site or remote monitoring facilities. The team from Knightscope had a great booth, complete with “Autonomous Neighborhood Crime Watch” parking signs for their, admittedly imposing, digital sentry. 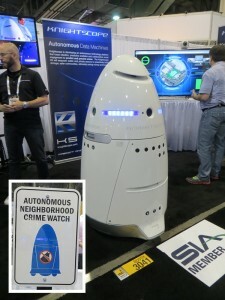 It wouldn’t be a stretch to call these futuristic security guards Dalek-like (for the Doctor Who fans), and it was fascinating to imagine a fleet of K5s patrolling a residential development or mall. It’s hard to say if these robo-cops will be on widespread duty anytime in the near future, but we’re interested to watch Knightscope as they continue to, quite literally, roll out the K5 and the other models in their lineup. Overall, ISC West 2016 was a great show for the Logic Supply team. We had a chance to catch up with many of our clients who are using our industrial and rugged computers for their security & surveillance solutions, and met many more who we hope to work with in the future. The importance of protecting information, property and personnel is important to every organization, large or small, and we’re excited to continue to provide the hardware backbone for so many of the products that are helping to keep us all safe.